Modern multi-speed bikes have sophisticated shifting with lots of gear that allows you to ride with the least effort in all road conditions. Advanced models of bikes have 16 to 30 speeds, of which 2-3 on the leading star and 7-10 on the slave. - set of Allen keys. For removing the old rear switch speeds, loosen the bolt rope and pull the rope. Then Unscrew the rollers on the gear selector, or remove the chain from the bike. Unscrewing the bolt to the switch, remove it. To install the rear shifter, screw it to the ceiling. When tightening the fastening screws of the retract switch back to avoid damage to the screw position of the upper roller relatively to the cassette. Then tighten the adjusting lugs on the switch and on the lever until it stops and loosen exactly 1 turn. Pull the cable drive, put it into the groove and lock the bolt. After you install the rear shifter, it must be adjusted. Adjustment is made by the mounting bolt control cable, a tension adjustment screw control cable, limiting screws upper and lower transfer screw adjust the position of the upper roller relative to the stars. The tension of the control cable can be adjusted by means of lugs on the lever. On some switches may not have all the adjusting elements, and the switches Simano additionally equipped with a tension adjustment screw spring parallelogrammic mechanism. Before adjusting, loosen the control wire adjusting screw or lug on the lever. Install the chain on the smallest sprocket. Rotating screw-top gear limiter set the frame with rollers so that the plane of the rollers to line up exactly with the plane of the small sprocket. Then install the chain on the largest sprocket. Similarly, rotating the screw-limiter low transmission, achieve precise coincidence of the planes of the large sprocket and rollers. Install the chain on the smallest front sprocket and biggest rear. Turning the screw adjust the position of the rollers make when pedaling ago the roller does not touch the teeth of the large sprocket, and between them was a gap of 3-5 mm. Try to shift gears by hand turning the pedals of a Bicycle. If the chain barely moves from big stars to small, loosen the control cable with the adjusting lug. Having a clear switch work, try switching under load as you ride the bike. If need be, make an additional adjustment. If the adjustment failed, check the freedom of stroke of the control cable. If it's sticking, clean it and lubricate. If it has broken strands, replace it. Check the alignment of the plane of the chain tensioner and the plane of the stars. When their mismatch straighten the bracket of the shifter. Inspect loose rollers. 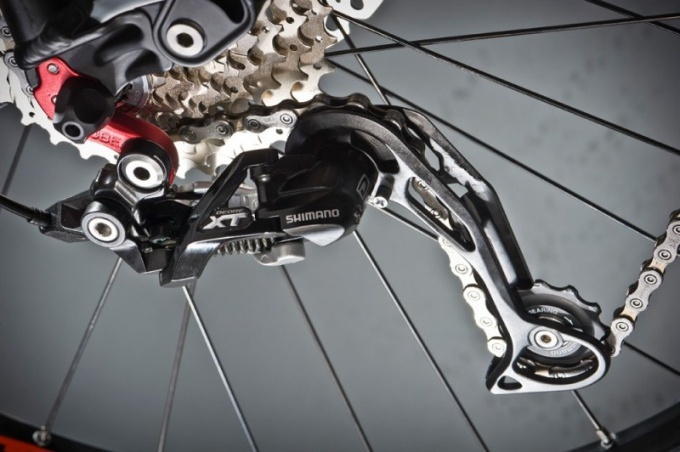 Backlash at the end of the frame chain tensioner in the transverse direction should not exceed 3-4 mm.